The annual Dietitians of Canada Saskatchewan Research Day was held on Thursday, April 20, in the Wascana Rehabilitation Centre auditorium in Regina. 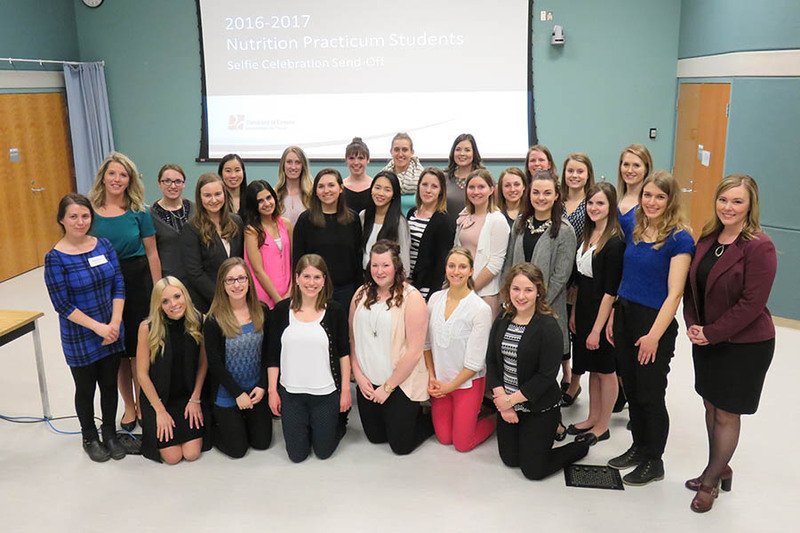 The day highlighted and celebrated the fourth year nutrition students' practice-based research project presentations, and featured presentations by leading experts in food and nutrition. Keynote speaker Dr. Jean-Claude Moubarac, PhD, discussed the health effects of ultra-processed foods. In his presentation “Drawing the Line: Ultra-processed foods and their significance for Canada’s dietary recommendations” he spoke about what he learned while involved in developing Brazil’s national dietary guidelines, and what lessons Canada can learn. A professional presentation by Roxane Wagner (BScNutr 1994), MBA, RD, titled “A Dietitian’s Unexpected Path in the Field of Sustainability” included her experiences as a co-owner of a sustainable vacation retreat in Honduras. Congratulations to the Nutrition Class of 2017 on completing their internships!